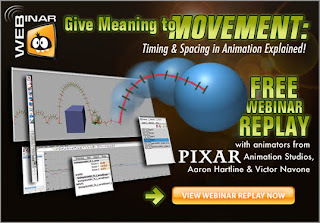 The live webinar that Aaron Hartline and I conducted last week is now available for replay online at AnimationMentor.com. We cover everything from basic timing and spacing principles through advanced texture. It's a lot to fit into 1 hour, I know, but I think it came out well. Check it out! Thanks for posting it. I didn't think I'd get to see this. It was full when I signed up.